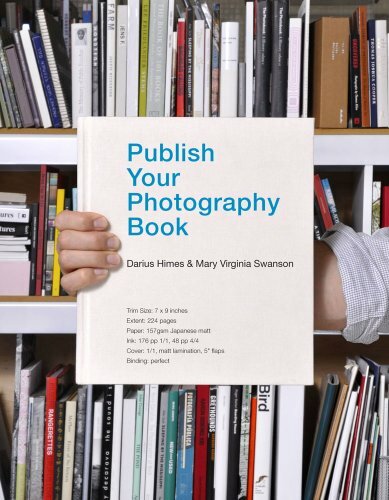 Publish Your Photography Book, by Darius Himes and Mary Virginia Swanson (Princeton Architectural Press, 2011) is a “must have” for anyone interested in publishing a photography book. It’s chock-full of information, and while it is possible to read all the way through from cover to cover, it’s really a reference book and, as such, might be best appreciated piecemeal, picking and choosing the sections that seem most relevant to the reader at any given time. Think smorgasbord. That may be in part because it was originally conceived as a series of articles for photo-eyeBooklist. The book is well-designed, with ample margins in which to take notes and nice, heavy paper stock; I’ve already dog-eared pages, underlined key points, and asterisked details that seem important for my own book project. But even if you aren’t immersed in making a photography book, if you dream of making one or if you just enjoy photography books, you’ll find something useful here. In addition to conveying the considerable knowledge that both authors possess, the book contains contributions by first-rate photographers, publishers, designers, and other industry voices. I particularly enjoyed the essay by Robert Morton. An editor, agent, and consultant with many years of experience, Morton understands the changes in the publishing industry over the past decade, particularly the loss of “courageous publishers” who “could and did take chances based on their taste and instincts.” At the same time, he sees hopeful signs in short-run, on-demand printing. It was also heartening to read case studies about making books written by photographers–-including some of my favorites: Lisa Robinson (Snowbound), Alec Soth (Sleeping by the Mississippi), and Paula McCartney (Bird Watching). Interspersed with longer pieces are inspiring quotes and pictures of book covers, perfect for those times when you only have a few minutes to spare. In the back, helpful appendices list publishers, distributors, submission requirements, and more. Having recommended the book enthusiastically, I need to add that some of the writing gave this reviewer pause, as when, for example, subjects and verbs did not agree in number, too many "ands" muddled the meaning of a sentence, or a word was repeated ineffectively (as in, “Working with a publishing company involves working with experienced professionals . . . You must be prepared to work . . .”). However, in fairness, Publish Your Photography Book is not aimed at an audience of English teachers. The prose is serviceable enough for its purposes and, depending on the author of a given section, sometimes quite good. I must also confess that I became discouraged by the number of times the authors’ advice was attached to spending: hiring a publicist and a designer, paying some of the publishing costs, providing promotional materials, attending portfolio reviews, and more. It seems that without ample resources of time and money, publishing a photography book—without having it languish, stockpiled, in a corner of your attic—is probably not in your cards. Perhaps including a section addressing ways in which photographers can raise money for book projects, such as grants, artist residencies, and funding platforms like Kickstarter, would have made the financial part of the process less daunting. And what if the work is truly excellent? What if the subject is as catchy as, say, Phil Toledano’s Days With My Father, which has now sold something like 14,000 copies? Are the steps always the same? In the end, it seems to me that what most photographers want is not just to publish a book, but to make a really good book, one that has enough appeal for a publisher to take on even when the photographer is not well known or the work does not mine a popular vein. But, as the Tao Te Ching says, “The Tao that can be told is not the eternal Tao.” There is no manual for achieving success, no surefire method for making great photographs; there are no ruby slippers to magically transport you through the publisher’s door. Short of that, however, Publish Your Photography Book can take you a long way down the road by answering some of your nuts and bolts questions and by helping you understand the process of making a photography book come to life.